Welcome! I’m So Excited You’re Here! On my journey to where I am today, I have been a sought after marriage and relationship expert, marriage coach, counselor, educator, speaker, entrepreneur and author. My husband and I founded The Marriage Coaches, a coaching and consulting practice. Because of our passion for successful marriages, we created the I Love Being Married Movement, our battle cry for the marriage community to rally around and bring positive press back to marriage. 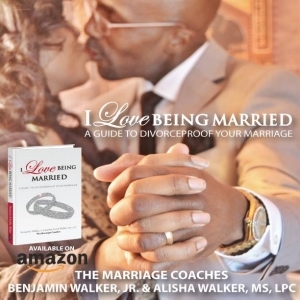 To further share our passion for marriage and help others with their marriages, Benjamin and I wrote , I Love Being Married: A Guide to Divorceproof Your Marriage. Together, we have coached thousands of couples on relationship strategies to enhance and divorce-proof their relationships. We created a website www.themarriagecoaches.net that houses our blog articles, podcasts and information on how to contact us for counseling, coaching, speaking and our book, products and classes. 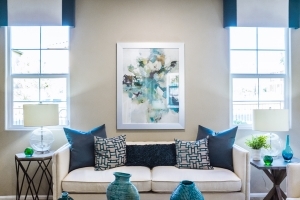 We have also written articles that have appeared on Essence Magazine online , and other large sites. We also appeared as guest marriage experts on an episode of a popular TLC reality television show and were marriage experts in an online Marriage and Relationship Academy. We were regularly asked to be guest speakers at conferences, events and retreats. Prior, to almost exclusively working with couples, I worked with women and founded Women’s Empowerment Movement, a non-profit 501(c)3 that worked to empower women to success. At the same time, I worked with families helping them work through any behavioral, family, educational or mental health issues that were present. Weaved throughout my over 20 year career, I have infused spirituality and love to share how my faith keeps my peace and allows me to move forward no matter the situation. I love to inspire, encourage and coach people and as a Licensed Professional Counselor, in the state of Georgia, I’ve been able to do just that. While building this business, as a family we were dealing with a family crisis. Our youngest daughter was born with Sickle Cell Anemia, a chronic blood disorder that can cause debilitating pain, consistent illness, damage to organs and even death. This as you can imagine took a toll on our family especially after she was hospitalized over 12 times, had 4 major surgeries, and being on a feeding tube all before the age of 3. We needed to make some changes to accommodate her needs. We scaled back the business and focused on her full time. She received a life-saving bone marrow transplant, was cured of Sickle Cell and is doing well. After having seen my daughter fight for her life, I decided to change many things about how I live my life, how I show up for myself and for my family and how I run my business. This is why, I am now providing online counseling services specifically for women. I believe you shouldn’t have to go through a harrowing story like mine in order to put things into perspective and I want to help you do that. Was it hard seeing my child sick? Yes. Did I have days where I was sad, anxious, fearful, depressed and even traumatized? Yes. But when I saw the strength that she had to fight for her life and want to live life to the fullest all while being in the hospital, I had to do the same. I am passionate about being the best woman I can be for myself, my daughters and for you and I want to help you do the same. I am proud to now offer a safe space for women, couples, parents, teens , educators and entrepreneurs to release the burdens of stress, anxiety, depression, and fear in order to live an extraordinary life. I provide online counseling for depression, anxiety, marriage issues, general life stress and people dealing with a need to get unstuck. I am a speaker on topics related to marriage/relationships, women’s issues, high achieving teens, parenting and self care for educators and entreprenuers. I provide workshops, CEU courses for therapists and online courses. I am graduate of Florida A&M University with a BS in Psychology and Nova Southeastern University with an MS in Mental Health Counseling. I have been married for 20 years and have 5 beautiful children.